repair seams, tears, leaks, flashing’s, coping stones, skylights, penetrations and more. It’s the do-it-yourself way to make fast, easy, economical, durable roof repairs. Roof repair can be very expensive. 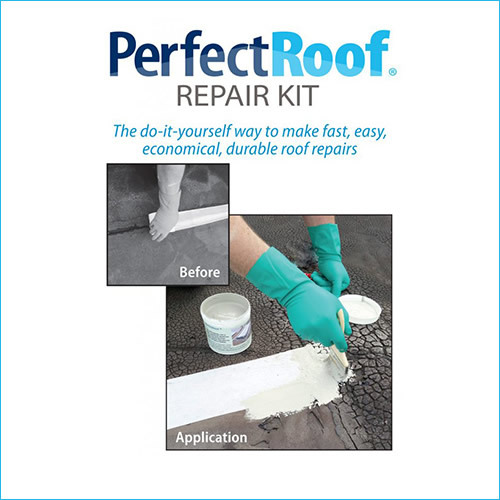 Save money by using PerfectRoof, an effective DIY roof repair kit that is all you need to repair cracks, roof flashings and seams. Ensure the surface is clean and dry. Remove debris from cracks by scraping or blowing. Clean surface with warm water and a sponge to remove grease, wax, dirt, loose particles and bio-matter. No special cleaning agents are required. You can add a few drops of dishwashing soap if the need arises. EPDM surfaces require a wipe down with lacquer thinner before applying the PerfectRoof system. If there are cracks, seams or flashings that need to be filled to ensure that they are waterproof, you will need to apply PhillyPutty to them. This is a flexible, waterproof paste that you can make on site by mixing TrueGrit aggregate and PerfectPrimer. When the surface is ready, apply PerfectPrimer using a half inch roller. This should be applied to the surface to cover an area with a length of not more than three feet. This should be wider than the repair fabric. Apply the Polytex fabric by unrolling it onto the wet area. Use a brush to smooth out the fabric working out to the edges from the center. Apply a second coat when the fabric begins to become tacky. The finished product ought to be waterproof and flexible. For best results, fold the fabric and cut a straight line along the fold before applying it. Apply primer thereafter and lay the fabric flat onto it. The system takes about 12 hours to cure.